The right to court is so important as it involves every citizen. 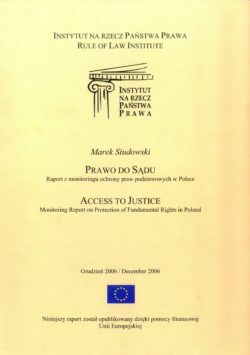 Nowadays, in the contemporary state of law the courts have become the ultimate arbiter of disputes, which is indeed the consequence of progressive jurisdiction in all life areas, of the universality of the principle of legality as well as of the absence of more reliable methods of settling disputes. Currently, the role of courts in the life of every citizen is constantly increasing. The current cases to be dealt with in a Polish courts were a few years ago known to Polish citizen only from U.S. media reports. The courts decide on euthanasia consent, settle disputes on the issue whether it is better to be born or not born (claims of “wrongful life”), on issues of public authorities’ liability for the unlawful establishment of law, etc.. The scope of the judicial cognition is increasing. In such situation, the answer to the question of how exactly the right to court should be shaped is very essential.